When I first began yoga, my back was so out of whack. The idea of the pose you see above was a terrible, painful, unimaginable thought! I never imagined that I would find backbends so invigorating and with that, find myself capable of deep binds (twists) and complete forward bends. It’s a work in progress, but one thing to note is that you have to stay committed to the little steps along the way. Allow yourself to take just what you need from stretches and over time (and before you know it!) you’ll be doing things you never thought possible. 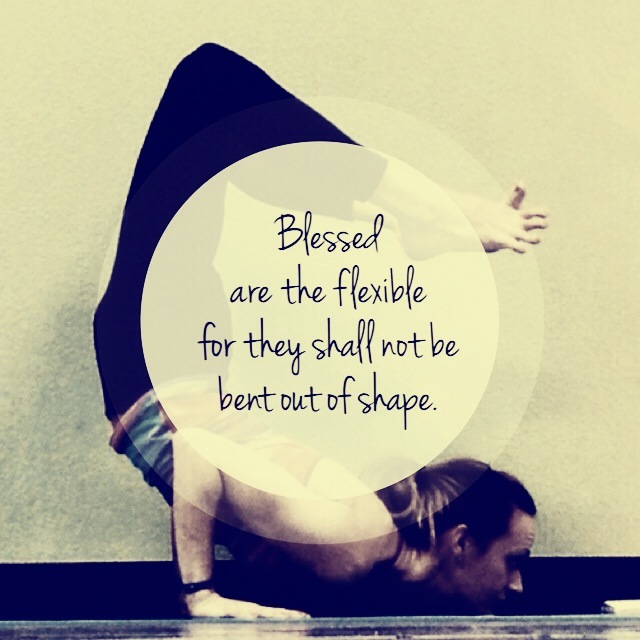 So this quote about flexibility being a blessing…it does not mean you are naturally flexible. It means you make an effort toward flexibility. Everything is a process and if you view it as something that will reach completion, you are robbing yourself of the possibilities that lie within you! It’s so important to keep our spines active. The spine carries the connection between our spinal cord and all of our nerve outlets. If it is not lubricated, it can cause us discomfort, pain, and mental fogginess. The more you practice yoga, the more it will become obvious that there are many balancing movements of the spine. 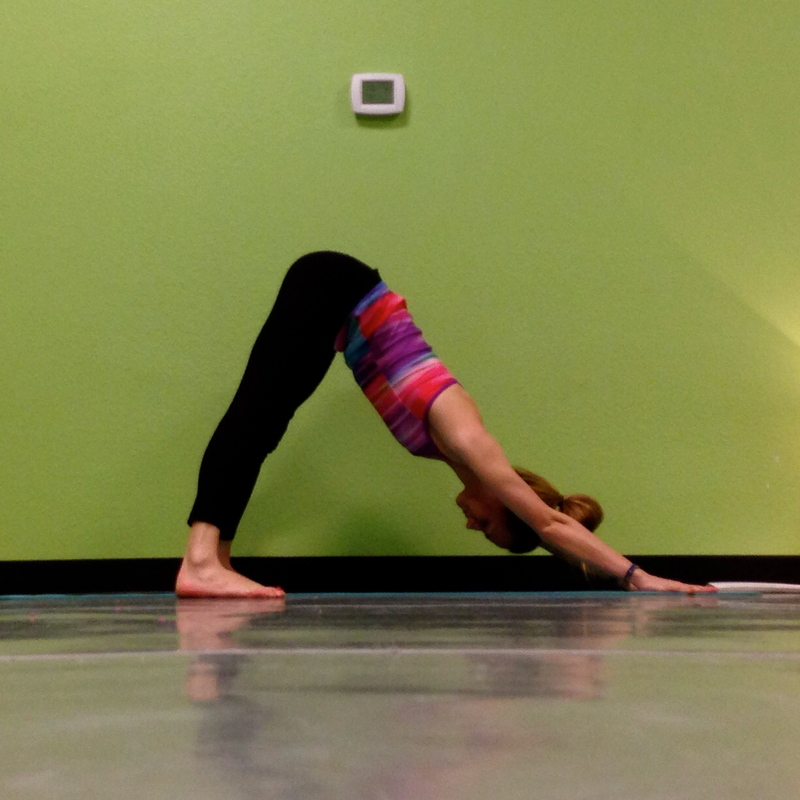 Three of these are: forward bends, backbends, and twists. These three actions help to keep your spine balanced and optimally functioning. Do the following poses often and you will feel more physically open and mentally focused. Make sure that you move very gently and never force your spine to deepen into any direction without first using an inhale to lengthen. Always deepen into spinal movements on your exhales. Inhale: Dip the belly button down toward the earth, tailbone and gaze reach high. 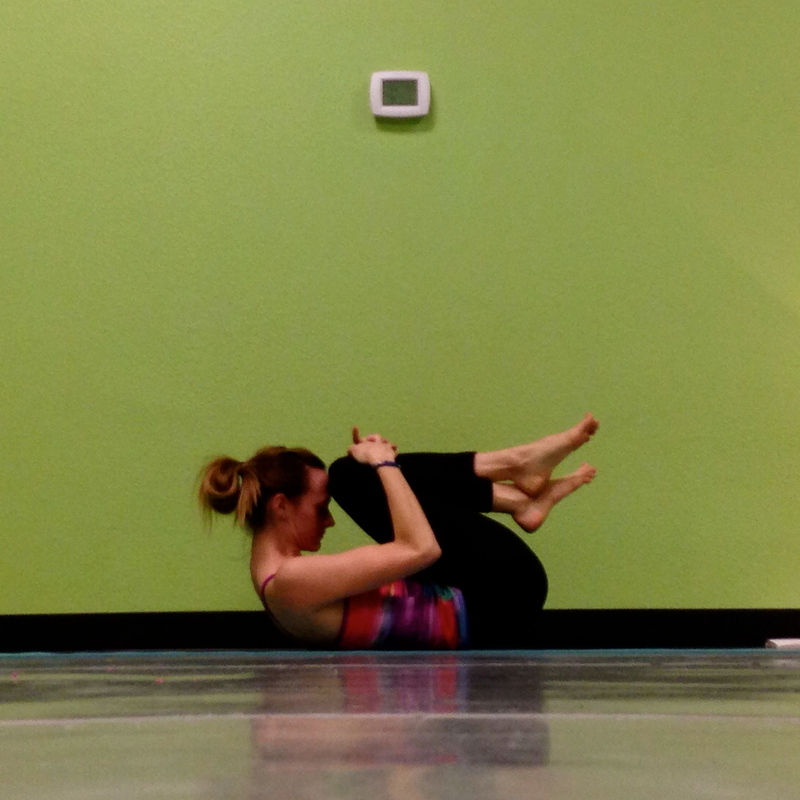 Inhale: From table top position, reach the R arm up to the sky stacking the shoulders. 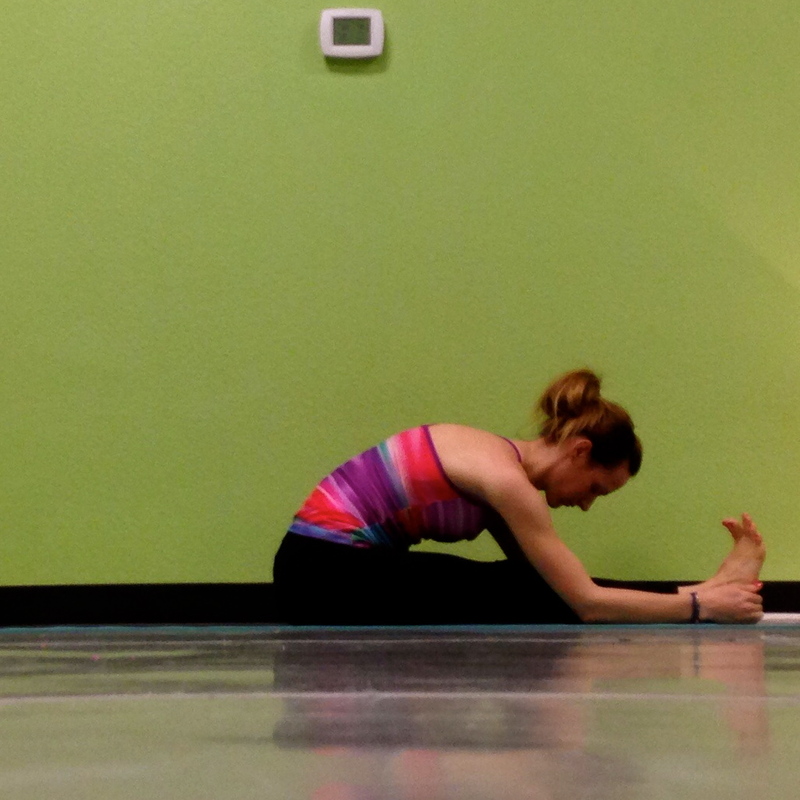 Exhale: Draw the R hand across the mat under the left arm, threading the needle. Relax the corner of the head onto the mat and take your left arm either overhead or wrap it around your back. Repeat on o/side. Exhale: begin to walk the hands to the top of the mat and melt your heart down towards the earth. Either your chin or your forehead can rest on the mat. Just make sure your neck feels safe. From a regular down dog position, take your feet out wider than your mat. Use your exhale to deepen into it, melting your heart toward the earth and slightly tipping the tailbone up to the sky to feel a nice release in the low back. To add the twist: Take a deep inhale, and as you exhale take the right hand for the left ankle. Allow your gaze to turn under the left arm. Take three deep breaths then switch to the other side. 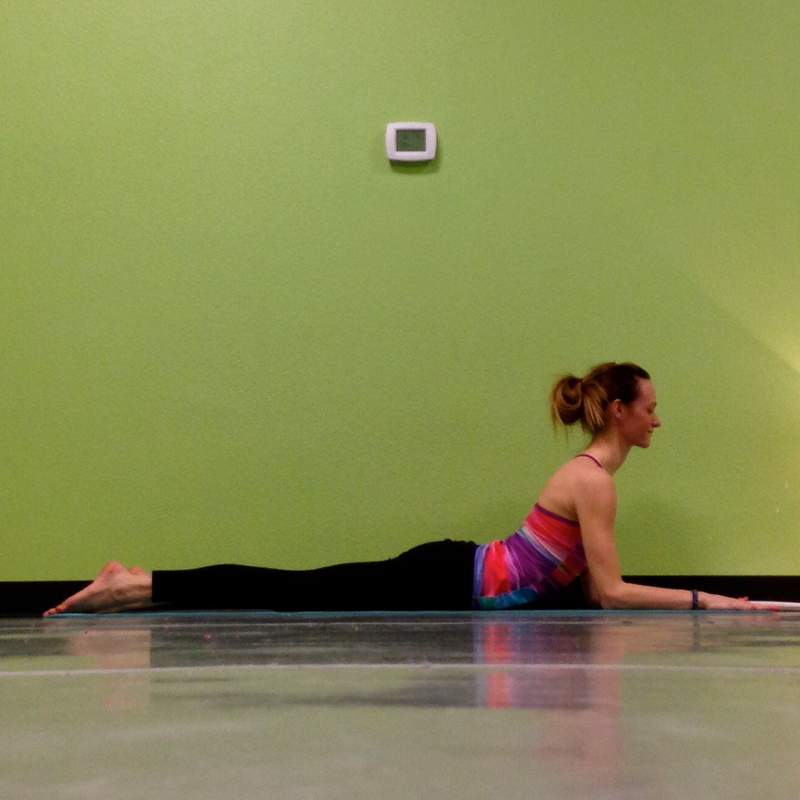 Inhale: From a standing wide leg position, lengthen the spine. 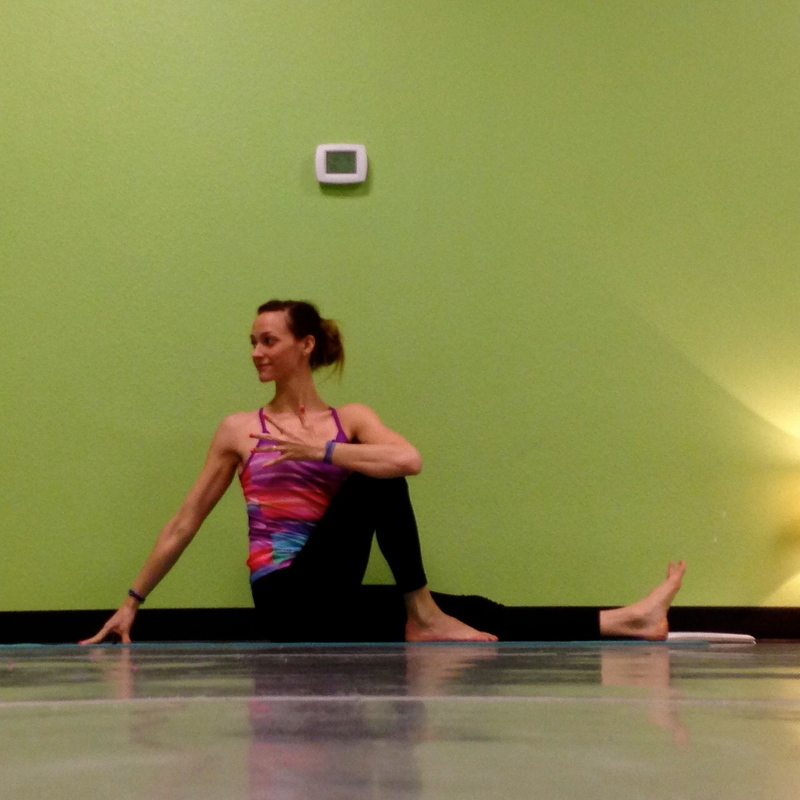 Exhale: Fold from the hip crease into your wide leg fold. Inhale up halfway for more space, exhale to deepen. Take 5-10 deep breaths. To add the twist: Inhale to lengthen up halfway reaching the crown of the head forward, place the right fingertips on the floor or a block. As you exhale, take the left arm straight up to the sky to stack the shoulders. You can keep the arm lifted or drop the hand down to the sacrum (the low back) for added stability and to keep the hips level. Inhale: From a lying position, come up to your forearms. The elbows should be shoulder distance apart and you can take the upper arms at a slight angle. 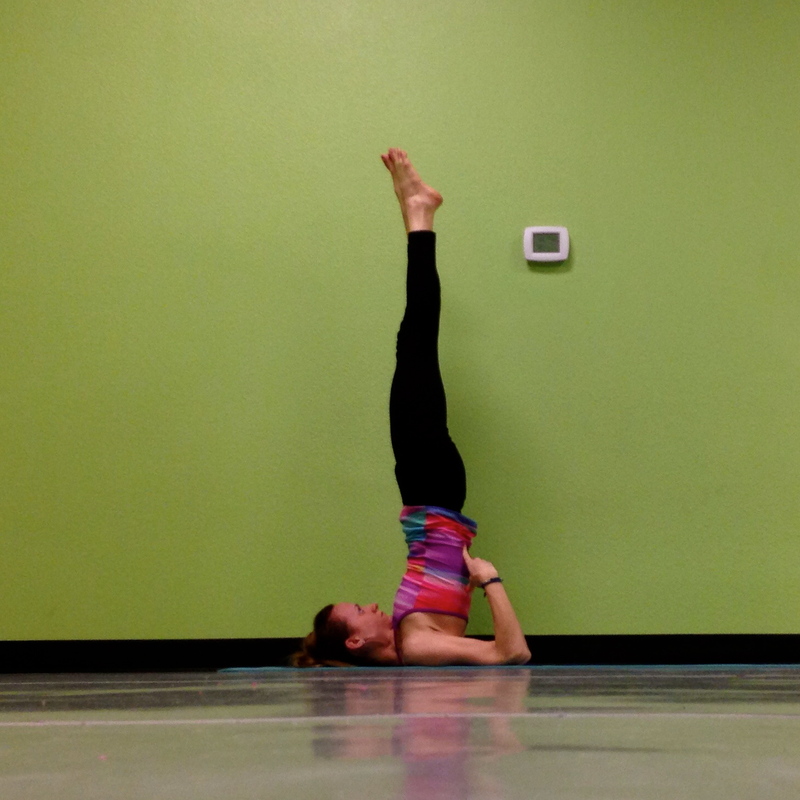 As you inhale, reach the crown of the head up, lengthening the upper back/neck. 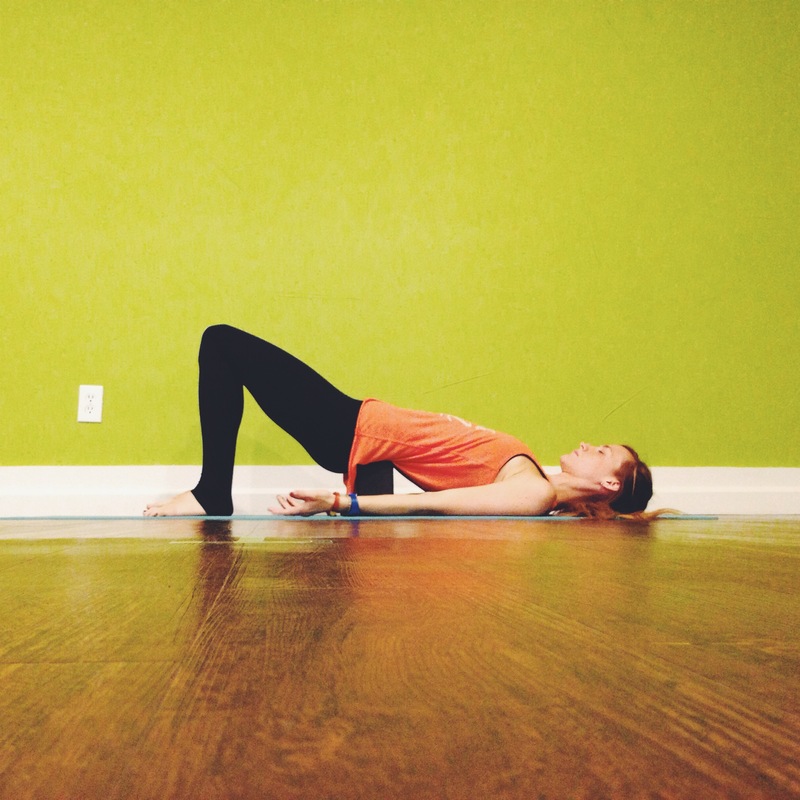 Exhale: Settle into the pose and slightly pull the belly button in toward the spine to stabilize the low back. 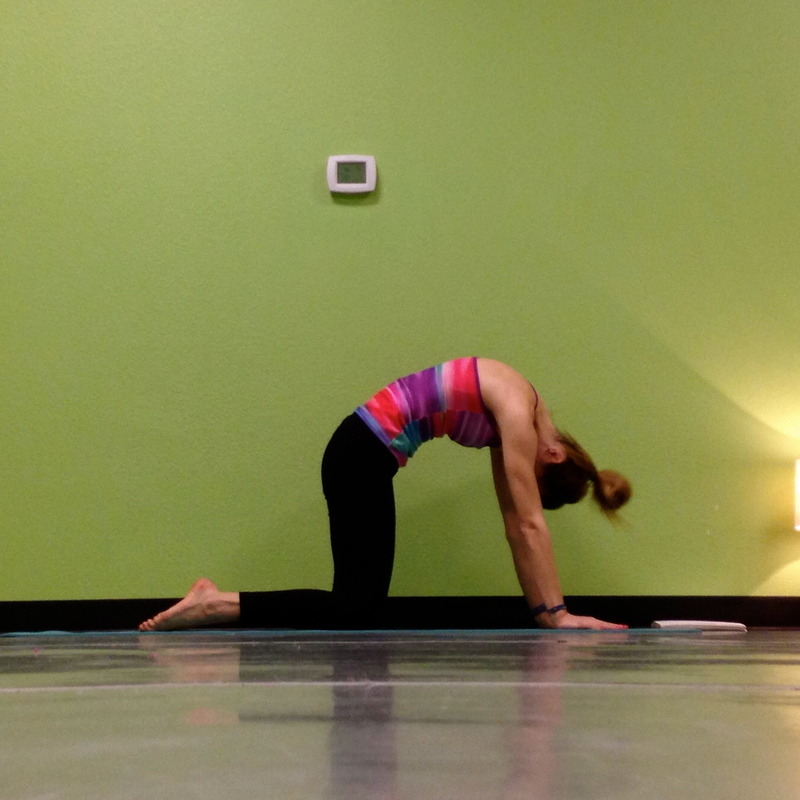 For seal pose: If you feel like you can go deeper in your backbend, walk your hands a little wider and a few inches forward. Straighten out the arms as you inhale. Exhale to engage the core and hold for 1-2 minutes. Inhale: From staff pose, take an inhale to lengthen the crown of the head up. Exhale: Begin to lean into your fold, reaching the heart forward. You may want to add a gentle bend into the knees to make a connection between the chest and the thighs. Worry less about touching your toes, and more about finding that connection. From staff pose, pull your right knee up, placing the sole of the food down to either the inside or outside of the left leg. Take your right fingertips behind you like a kickstand to keep your spine long. 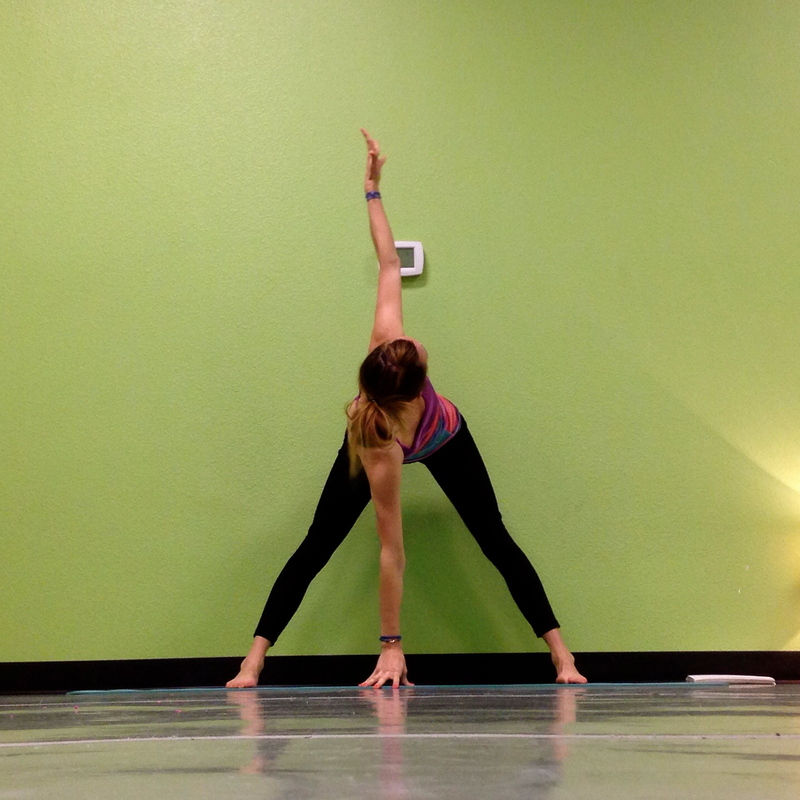 Inhale: With the right hand behind you, take the left arm and reach it up toward the sky. Exhale: Begin to twist and take the left arm and wrap it around the right knee (you can also bring it to the outside of the knee). Take a few breaths here. Inhale: From a lying position, walk the heels in toward the hips (3-4 inches). Make sure the feet are hips distance apart, all ten toes facing forward. Begin to press into the feet, lifting the hips up toward the sky. Exhale: Allow the chin to roll in toward the chest, but at the same time, pull the chin away from the chest (lengthening the neck). Keep your belly engaged and your gluts as relaxed as possible. You can also place a block under the sacrum and make it more restorative. 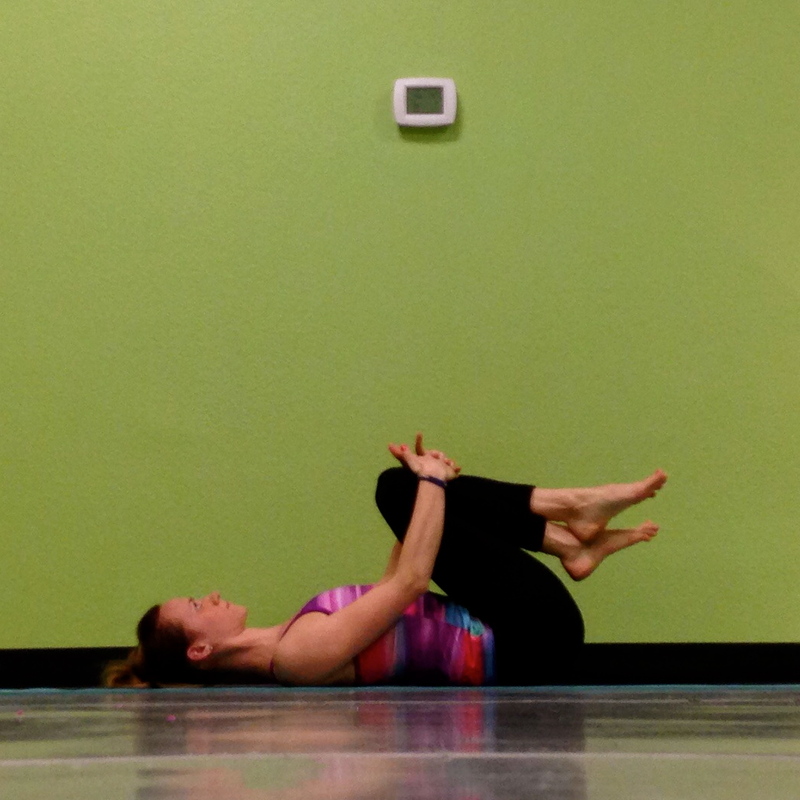 Hold 10 breaths then slowly release vertebrae back to the mat. 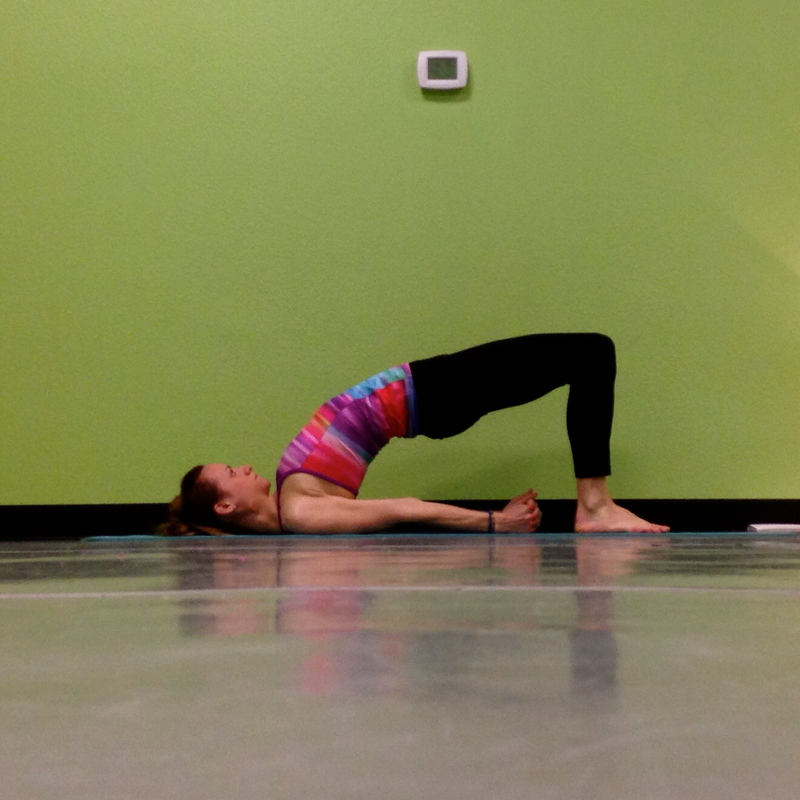 Inhale: From bridge pose, take your hands into your low back. Begin to lift one leg at a time into the air. 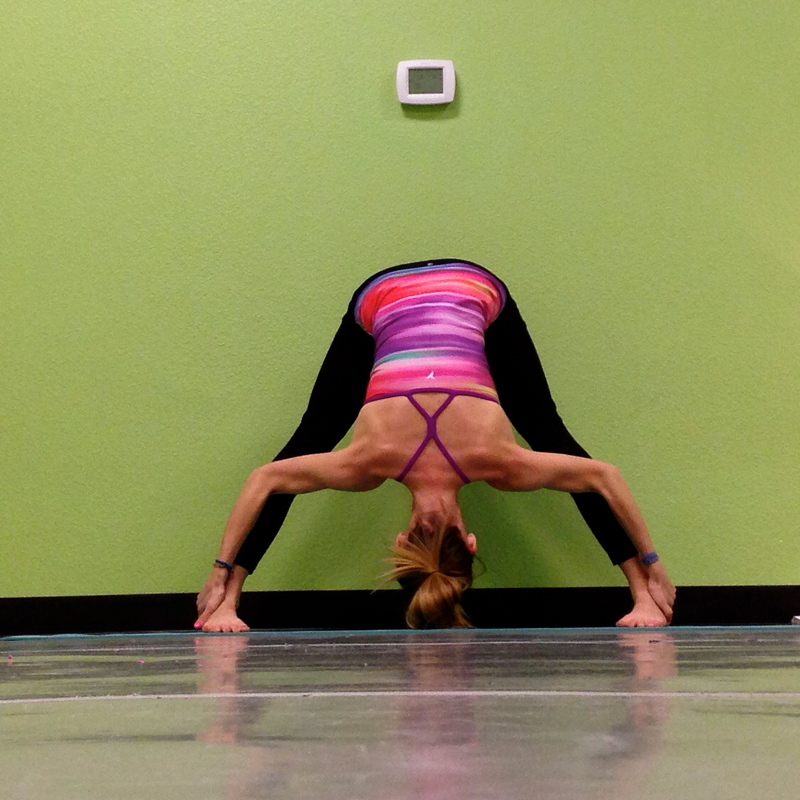 Exhale: Walk the hands toward the upper back as your legs raise up to their highest point. 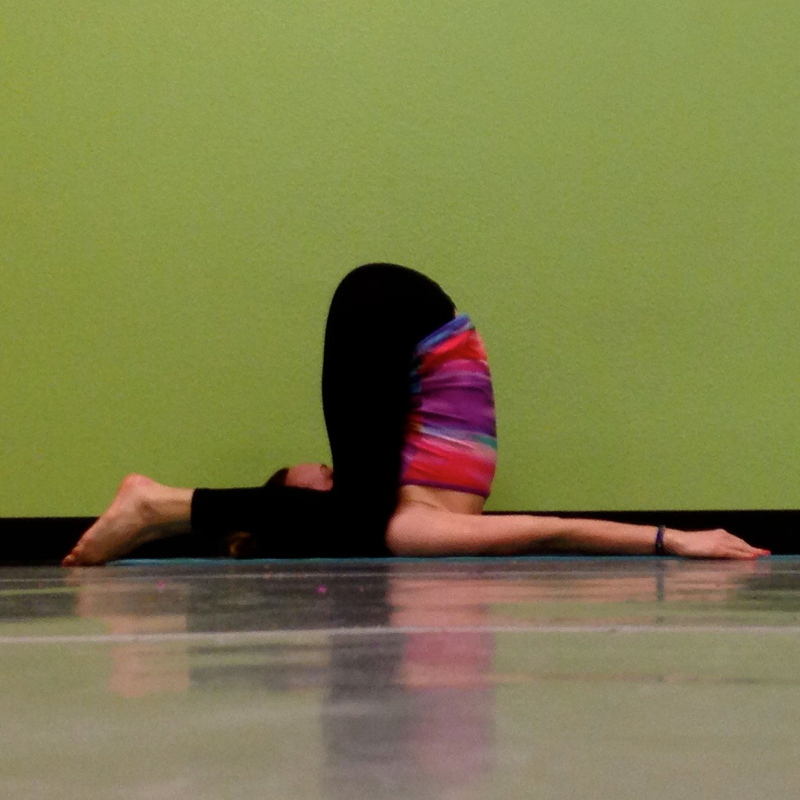 If you have the flexibility, you can hold here a few breaths and then drop the toes to a block or the floor behind you. 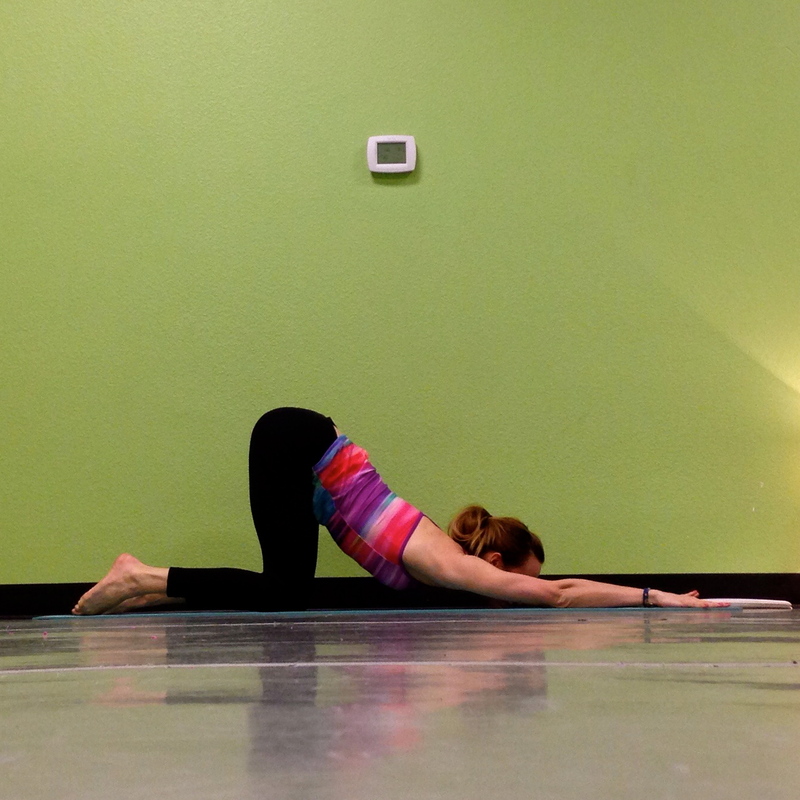 Keep the legs straight or bend the knees and come into snail pose (shown here). 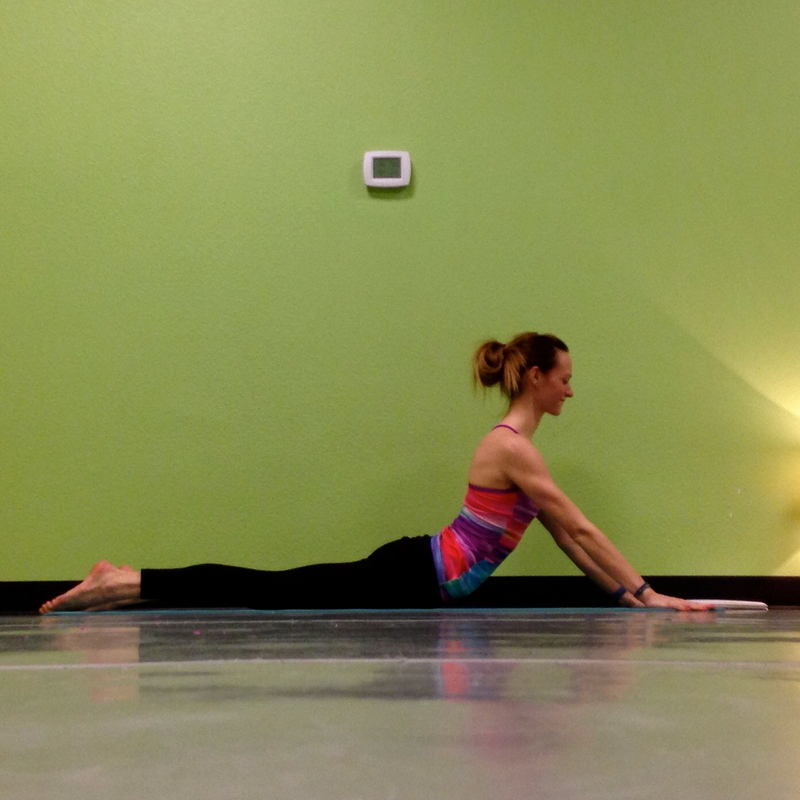 If you drop back to plow or snail pose, make sure you counter with a fish pose for a few breaths. Before you close in final relaxation, pull the knees into the chest and wrap your arms around the shins. Take a gentle rock side to side and maybe pull the forehead up to meet the knees curling into a little ball. Take a few breaths and feel the space you have created in your spine through these gentle stretches. After you finish, stretch the body out long by inhaling and reaching the arms overhead, pointing the toes and allow the low back to lift. Exhale and take a few minutes in savasana with your eyes heavy and your body relaxed.